Our CF® dye hydrazides are bright, extremely water-soluble and non-toxic. These properties make the dyes excellent fixable polar tracers for neurons, or for gap junction studies. The dyes can be introduced into cells by microinjection. Hydrazides also can be used for labeling aldehyde or ketone groups, such as carbohydrate molecules after peroxidation with periodate. However, for this application we recommend using CF® dye aminooxy forms, which are more reactive toward these groups than hydrazide forms. For 2D-DIGE platform, we recommend CFDI hydrazides. CF®DI dye hydrazide could be used to react with aldehyde or ketone groups from protein carbonylation. CF®DI dyes are designed to match for charge and molecular weight for 2D DIGE platform. Cyanine dye with an aminooxy reactive group could be used to label a target molecule with an aldehyde or ketone group. Aminooxy group readily reacts with an aldehyde or ketone group to form a stable linkage without the use of a reducing agent. Aniline, 10X in acetate buffer is designed to use as catalytic reagent for the optimal coupling of protein carbonyls with aminooxy compounds. 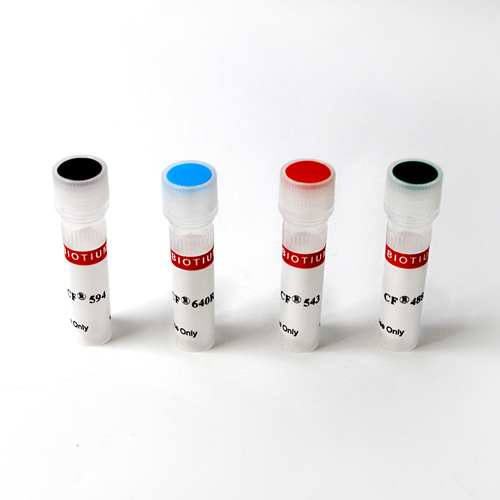 CF® dye biocytin is a cell-impermeant, fixable polar tracer that is a conjugate of CF® dye and biotin with an aldehyde-fixable primary amine. Polar tracers are commonly used to investigate cell-cell and cell-liposome fusion as well as membrane permeability and transport through gap junctions or cell uptake during pinocytosis.